Let’s start this review by saying that collectively, this cast has a total of four Oscars, one Golden Globe, four separate Oscar nominations and three other Golden Globe nominations. Now let’s continue this review by saying that not even the likes of James McAvoy, Emily Blunt, Maggie Smith, Michael Caine and Julie Walters can save a crap screenplay. 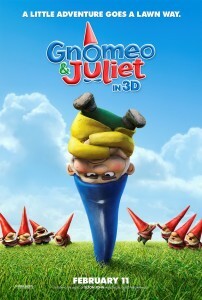 Gnomeo & Juliet is exactly what it appears to be, a loose retelling of Romeo and Juliet via the enchanted world of garden gnomes. The Capulets and the Montagues have essentially been reduced to “Red” vs. “Blue”, and instead of swords and poisons, these cute little gnomes try and dispatch each other with the most logical weapon available to gnomes…lawn care equipment. In fact, so much emphasis is put into these “turf wars” that “Red vs. Blue” seems like less of a reference to the Capulets vs. Montagues and more of a reference to Blood vs. Crips. This is certainly not one of the adult friendly kids movies in the vein of Up, Despicable Me or Shrek, but rather a couple steps above the Jack Black version of Gulliver’s Travels; Gnomeo & Juliet doesn’t insult your intelligence as much either. While Gnomeo & Juliet isn’t great, it could be a lot worse; the kids in the theater laughed at the steady flow of slap stick and the soundtrack features the music of its producer, the one and only Elton John. If there were a single word to describe this movie it would be “uninspired”. From the use of 3D, to the jokes, to the overall interpretation of Romeo and Juliet, Gnomeo & Juliet brings nothing new to the table. Think this is an attempt by the powerful gnome industry to boost sales? Let us know in the comments section.